'Revolution: Apple Changing the World' is all about where he sees its place in the tech world. 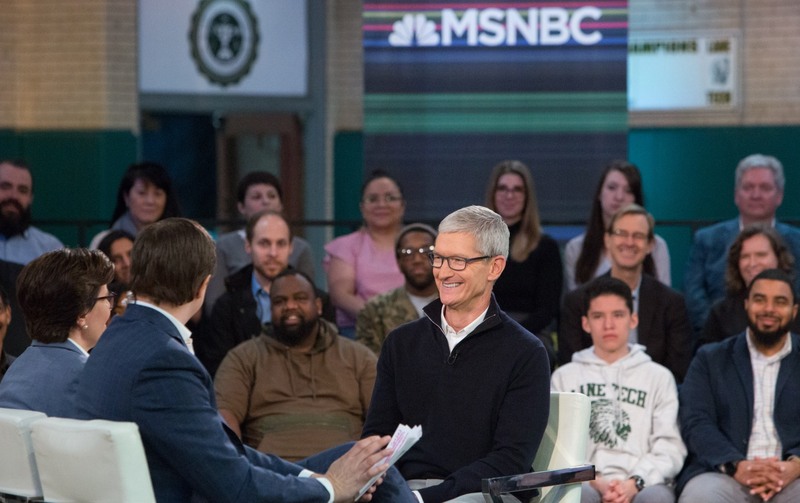 During the "Revolution: Apple Changing the World" interview airing on MSNBC, Apple CEO Tim Cook gives his two cents on many issues facing the tech industry, most notably ones affecting competing giants Amazon and Facebook. That includes privacy and how Apple's approach to the issue differs from others, which Cook has addressed before. If you were hoping to hear more about the missing-in-2018 new Mac Pro this isn't the place, but here's what he's saying now to Chris Hayes and Kara Swisher about the company's recent tussle with the FBI over encryption. "The truth is we could make a ton of money if we monetized our customer. If our customer was our product, we could make a ton of money. We've elected not to do that." Cook: The only way to protect your data is to encrypt it. There is no other way known today. And so, if I were you, I would do business with no one that wasn't doing that. Now, it is a thorny issue from a law enforcement point of view, because they may want to know what you're saying, and I don't have access to what you're saying. And my view is kind of simple, is I don't think that you as a user expect me to know what you're telling people, right? Cook: I'm not eavesdropping on your messages and on your phone calls, and don't think I should be in that position. And so, if they tried to compel us, as they did 2 years ago - they tried to force us to create a piece of software that would have it stolen, opened hundreds of millions of iPhones in the world. We said, "Hey, there's lots of things technology can do. That one shouldn't be done. It should never be created." And so we refused. They said, "You can't refuse. We can make you do it." We said, "No, you can't. It's against the Constitution." And - and right before they went to court, they dropped the case. And - and so if that same circumstance rose again, we would fight. Because this - this, again, is a value of America, right? You should not be able to compel somebody to write something that is bad for civilization. Right? This is a fundamental wrong. Naturally, he also spoke directly about Facebook's privacy flap, saying that if he were Mark Zuckerberg, he wouldn't be in this position, and that it's Apple's view that the kind of detailed profiles at issue shouldn't exist. When it came to Amazon, the discussion turns to a possible location for Apple to create a new site, beyond its HQ in California and facility in Texas. Basically, wherever it will be, you shouldn't expect to see the kind of contest atmosphere that's surrounded Amazon's search for a city to host its second headquarters. You can view the entire interview on MSNBC starting at 8 PM ET, with more information on MSNBC.com and Recode.com. "Coding is nothing more than a way to express yourself. It's a language. The core skills in coding - critical thinking, problem-solving - these are things that are modern-day skills required for living."